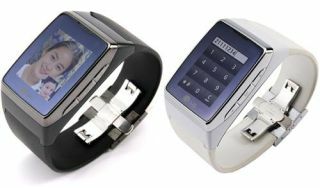 LG has moved to strike claims that the GD910 watch phone, which has been reported to debut in the UK in July, are premature. Apparently the only country confirmed to pick up the new device next month, which will be exclusive on Orange, is France. Also reports that a €1,000 price tag have been dismissed, with the Korean firm stating no such price has been confirmed. However, the GD910 could still debut in the UK during July, as a specific release date for the handset has not been given. The main issue appears to be the fact the information has come from LG's headquarters in South Korea, with the press release being written in Korean. It says that the phone will launch in July in Europe next month, but there's no confirmation of an actual launch date (according to the variety of translation software we ran the release through). The GD910 is set to be a real innovation in the mobile phone market, as it's the first time we've seen a tier one manufacturer enter this market segment, especially on a worldwide scale. However, it will be interesting to see who decides this 1.5-inch watch, which is likely to be pretty expensive, wants to shell out for the new device.